Exclusive! Trot off to dreamland! 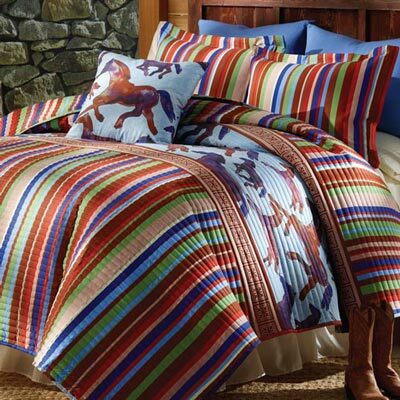 Colourful steeds and coordinating stripes bring a rustic, yet refined, Southwestern touch to your bedroom. Adds bold, brilliant colour to a sterile dorm room. Unisex styling makes it ideal guest room décor, too. Our Wild and Free quilt set is made of soft, long wearing polyester microfibre with polyester fill. Machine wash. Imported.